High quality Falcon Spaceship model which could be used in fly genre game. 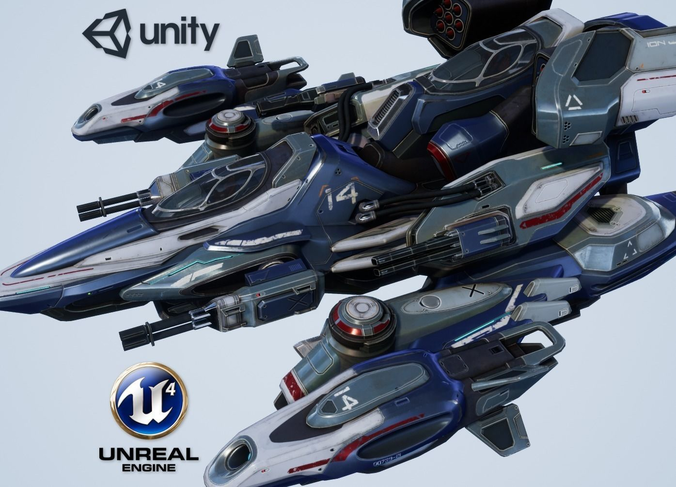 Package contains Unreal Engine 4.15.1 project, Unity 5.5.1 f1 project, Maya 2016 scene, also model exported as FBX and OBJ files. This asset is optimized and hand tweaked. The textures looks amazing and super realistic, tuned for Physically-Based Rendering. Unreal Engine project also contains animated well-looking exhaust FX for this model. Following textures included: Diffuse, normal map, AO, specular, illumination, roughness (green channel in_m texture) and metallness (red channel in_m texture). Pivot placed in 0,0,0 position. This model looks fantastic !